Another solution for gaining inseam clearance is shortening and/or recontouring the seat. We no longer have a contact for these mods. If you have a good source please let me know and we can direct inquiries their way. 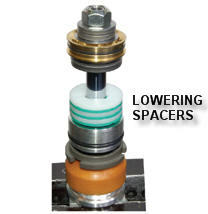 Prices: Cost for lowering suspension varies greatly. Some models only need spacers and springs while others need custom machining and springs or spring modifications.